Labor Day is almost here. And for many of us, Labor Day is our last chance to squeeze in a summer trip before Autumn arrives. But if you’re a pet owner, you probably hate to see the look your dog or cat gives you when you start packing for a weekend getaway. But luckily, there are plenty of pet-friendly getaways that you and your furry friend can enjoy this Labor Day. From pet-friendly hotels with yappie hours (you read that right) to dog-friendly restaurants, a pet-friendly getaway allows you and your dog or cat to enjoy memorable new experiences together. And on top of that, we’re a pet-friendly private airline! So we can get you and your pet to your getaway in style, safety, and comfort. There’s no wrong time for a beach get-away. And when you vacation in Key West, you can indulge in the country’s best key lime pie and catch a tan on the golden beaches. Your pet will love Key West, too. If you’ve got a dog, hit up the Key West Dog Beach for a romp in the sand and waves. And if your dog really loves water, take them out on the open ocean with Lazy Dog Kayak. The Hyatt Centric Resort & Spa offers high-class (and pet-friendly) accommodations. Get a room with a view of the water that you can retire to after a day on the beach and exploring Old Town Key West. Key West offers a wide array of pet-friendly restaurants. Find the freshest seafood for you and your pooch at places like SHOR at the Hyatt Centric Resort & Spa, Salute! On the Beach, or Blue Heaven. Book a private flight to fly you to Key West International Airport, where you can take a shuttle or private car to your accommodation. The Finger Lakes region of upstate New York is one of the most picturesque places in America. 11 lakes anchor this gorgeous landscape that’s littered with wineries, craft breweries, and waterfall-laden state parks. Start a day off by exploring the natural beauty of Watkins Glen State Park (keep your pet on a leash) before settling into any one of the pet-friendly wineries for an array of samples. It should be particularly beautiful around Labor Day, with temperatures in the 70s to low 80s. We recommend calling ahead to wineries or breweries to double-check that your pet will be welcome. For something a bit different, try a vacation rental. If there’s ever a place to rent a vacation home, it’s the Finger Lakes region, which is full of upscale rentals where you and your pet will feel right at home. How does a brunch of Bloody Mary’s and a menu stacked with local eggs, New York cheeses, and seasonal fruits sound? You and your pet can enjoy this incredible menu on the patio of the Glen Iris Inn in Letchworth State Park. Private is the fastest option here, as a charter flight can take you straight to the Finger Lakes Regional Airport. From there you can book a luxury shuttle to your accommodation. Northern New Mexico offers an incredible array of iconic desert landscapes, mountain getaways, winery-lined canyon roads and world-class dining and fine art. Spend your days exploring national parks, art galleries and shops in the beautiful adobe downtown of Santa Fe. At night, you can enjoy authentic southwest cuisine and watch traditional indigenous dancing and music in the plaza square. Ten Thousand Waves is a breathtakingly authentic Japanese spa experience with five-star dining and pet-friendly accommodations. It’s tucked away in the desert mountain landscape just outside of Santa Fe. Let the scent of piñon and juniper soothe you as you soak in one of their outdoor private tubs and while your pet takes a snooze in a cozy pet bed offered by the resort. You can’t experience Santa Fe without indulging in authentic New Mexican cuisine. Look no further than The Shed, located in the middle of downtown Santa Fe. Their charming patio is the perfect spot for you and your pet to enjoy green and red chile (Christmas style!) blue corn enchiladas and a prickly pear margarita. Just make sure you and your pet bring an ID! Drop into Santa Fe Regional Airport via private charter, then take any number of ground transportation options to where you’re staying. Right on the eastern edge of the Canadian Rockies sits the beautiful and pet-friendly city of Calgary. Treat your dog to a romp throughout any of the city’s 150 off-leash dog parks. Be sure to include a visit to the iconic Banff National Park as part of your adventure. Endless miles of mountains, glaciers, rivers, lakes and forests make for a heavenly escape into nature for you and your pet. The city of Calgary offers plenty of high-class and pet-friendly accommodations, like The Fairmont Palliser or the Hyatt Regency Calgary. Get your country music kick and tickle your dancing fancy at Ranchman’s Cookhouse and Dancehall while digging in on their mouth-watering BBQ. And for your pooch, they’ve got a dog-friendly outdoor patio with water bowls available. Calgary International Airport offers a private jet facility where you can land in your private plane. Hire one of Calgary’s top-notch limo services to get you from there to where you’re going and back again. What better way to truly treat yourself and your pet than a trip to the City of Light? Some of the world’s best food, art, and culture resides in the streets of Paris, France. The art-filled Louvre, the inescapable Eiffel Tower, and the epic Jardin du Luxembourg are just some of the attractions that call romantics the world round to this city. You can take your dog to the Champ de Mars park to take in the Eiffel Tower, and then explore the pet-friendly east side of Jardin du Luxembourg (Luxembourg Gardens, for which Palais du Luxembourg serves as backdrop). As for the Louvre, you can’t take your dog into the museum itself, unless it’s a service animal. But the good news is that Paris is full of dog-lovers, which means there are options for finding a friendly dog-sitter while you dig into fine culture. Check out Doggies & Compagnie for a reliable doggy day care. Paris is known for its luxurious and world-class pet-friendly hotels. Try the Shangri-La Hotel Paris, the Grand Hotel du Palais Royal or the Four Seasons George V Paris. 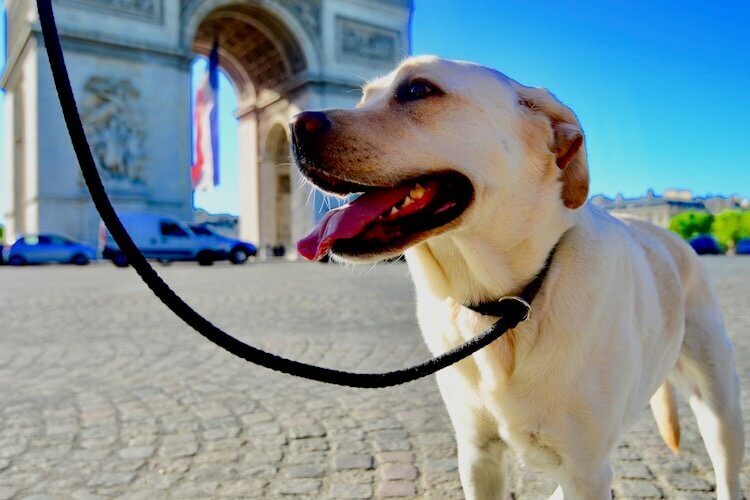 Your pet is welcome on the patio of Au Petit Sud-Ouest, where you can enjoy some authentic French food within walking distance of the Eiffel Tower. For a French breakfast with your pet, try Cafe de L’Industrie’s patio, near the Bastille. Paris-Le Bourget Airport is over 100 years old, and it’s the preferred landing spot for private airplanes in the area around Paris. It’s also where Charles Lindbergh completed the first ever solo transatlantic flight in 1927. Amor Prestige Driver can get you from there to where you need to go. And while you can’t book Lindbergh’s Spirit of St. Louis, you can book a safe private flight with Mountain Aviation. From bird-hunting in Montenegro with your dog to exploring the cities and American countryside with your cat, there are endless trips you can enjoy with your pets. Private planes give your pet the opportunity to stay with you wherever you go, so they don’t have to travel with the cargo. But did you know that private planes and their pilots help animals in other ways, too? Whether it’s aiding in environmental conservation efforts or saving animals affected by natural disasters, there are a lot of ways in which private planes help animals around the world.